We were having the run of our lives. Cross-on wind, huge beach, consistant 20 knot wind hitting our 7m & 9m Frenzy’s, no-one else in sight. That was until we rounded a headland, and saw a hundred kites in the sky! Once we had both slid to slow down and prevent clashing kites with others, we wondered where this was – we hadn’t seen a single kite since Natal and only one tourist, so it was quite a sight. It turned out Cumbuco was not the lazy fishing village we were expecting, but a huge kite surfing destination currently holding the Brazilian kiting championships. Word soon spread about the two mad brothers with their amphibious buggies (probably not helped by our little show-off race down the busy beach). We were set to meet Louis Tapper, a professional kite surfer and speaker who last year broke the world record for the longest distance kited unsupported (2000km along the coastline of Brazil). Our fears of not finding him in such a huge place were unfounded as he turned up at our room after walking down the beach asking innocent kiters if they had seen a couple of weird buggies fly past. Most had. Whilst in Cumbuco, we were set a challenge by the kiters. Race the next 70km against a kite surfer. What was quickest, kite board or buggy? Our bravado (fuelled by far too many Caiprihinas) meant we believed we could fly along the beach at 30-40mph, never slowing for soft sand, rivers, or rocks. We were sure we could win so the challenge was set. The kite surfers picked Louis Tapper, as the surfer with the most experience of the coastline, and we picked… ourselves. Two chaps who have never seen this coastine and who have been buggying since last week. As soon as the tide was low we set off. Kitesurfer V kite buggier. As we rounded the first headland we saw a huge bay and a bunch of rocks. We quickly dropped the kites, packed them up and started jogging along, buggies in tow. Louis flew past us with a wink and wave. Lifting the buggies over rocks larger than a car, whilst seeing Louis believe he had time to play in the surf was frustrating to say the least! To then see a river far too wide and with current far too strong to kite across (our buggies float!) meant game over to us! It took us an hour to strip down and swim the buggies over, at which point we had lost sight of Louis. 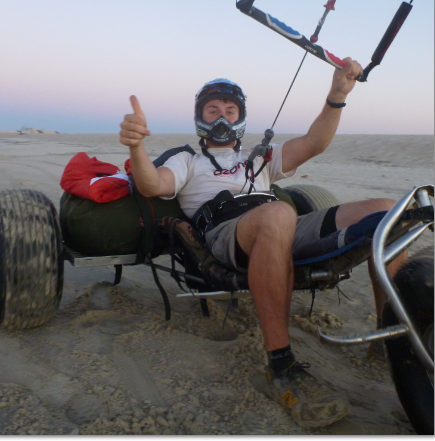 We quickly re-launched our kites, and took off after Louis determined to do the buggy community proud! Flying along the beach after the river, our Video VBOX registered our fastest speed so far: 43 mph. Unfortunately it was at 42 mph that Harry hit a hidden river. He managed to aqua-plane half way across, but the combined weight of buggy, person and kit soon stopped dead, sending Harry flying out and landing on his face the other side! Luckily unscathed. A quick glance at Louis’s kite on the horizon was all that was enough to get him up and jumping in the river to retreive his drifting buggy. On we went, maintaining nearly 40mph along the thick sand, sure we had now caught Louis up. We crossed the last river, and arrived at our finish point after the sun had set ready for the long wait for Louis. Shattered and relieved to have arrived unscathed, we dropped the kites to see Louis emerge from the palm trees, grinning, dancing, and flying our Ozone flag. He had won. We apologise to the buggying fraternity. We had failed. Re-match? This entry was posted in Buggies, Computer Solutions, Craig Hansen, Gear, Journal, Kites, Ozone, Sponsors by Charlie Thuillier. Bookmark the permalink. WHAT an awesome story! Keep going lads, it’s brilliant. Cool, can’t wait to see that then! Stay safe, you’re obviously enjoying it. By ‘eck you’ll be fit when you get back will you not? Yep, legs still feeling a bit dead! Off windsurfing in a bit though with Club Ventos – the wind here is too good to miss. Hope all good with you. Thanks Kev. Yes we’re going further and faster each day (terrain permitting), it’s a great feeling to be eating up the miles under wind power alone, although controlling speed wobble is quite tricky at times. 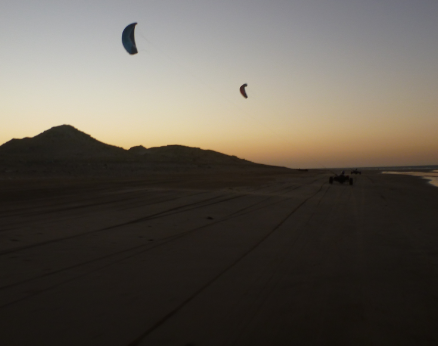 The outlaw buggies have been incredible as have the frenzy and access kites, although currently repairing a tear in the 4m in Baleia. This sounds really amazing ! Im pretty sure you are enjoying all trip…and meet with Louis was a good oportunity! If you are thinkning about coming back to Natal/RN at the end of your journey would be great to hear how was your experience! Be my guest if you intend to come! Take care and have a safe journey! Hi Clenio – thanks for the offer! We´re just flying out of Fortaleza and no time to go back down to Natal though I´m afraid. 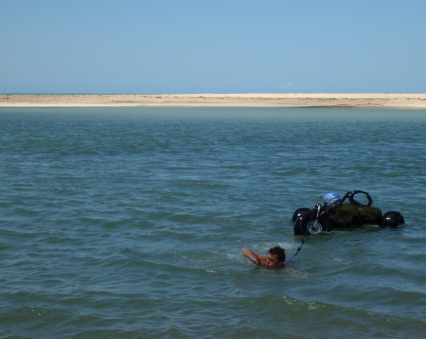 Louis was great – we did some funny downwinders with him on the water and us on the beach. If we come back to Natal I´ll be in touch, hope your hotel is doing well and enjoy the kite surfing! Hi admin, your page is incredible i know very useful tool for every webmaster (for content creation and SEO).